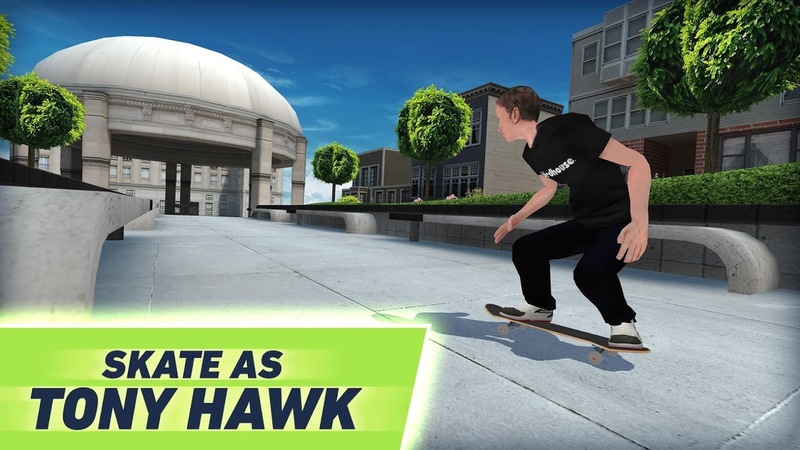 Tony Hawk's Skate Jam is a free-to-play title. It doesn't cost anything to download, though there are more than a few in-app purchases available in the in-game shop. They range up to $99.99 per item. Mainly these items consist of coin and cash packs for each of the two available in-game currencies, but you can also expect to find a few player boosts as well as starter packs that contain board skins, boosts, and cash. The gameplay revolves around two main modes, Skate Jam and Career. 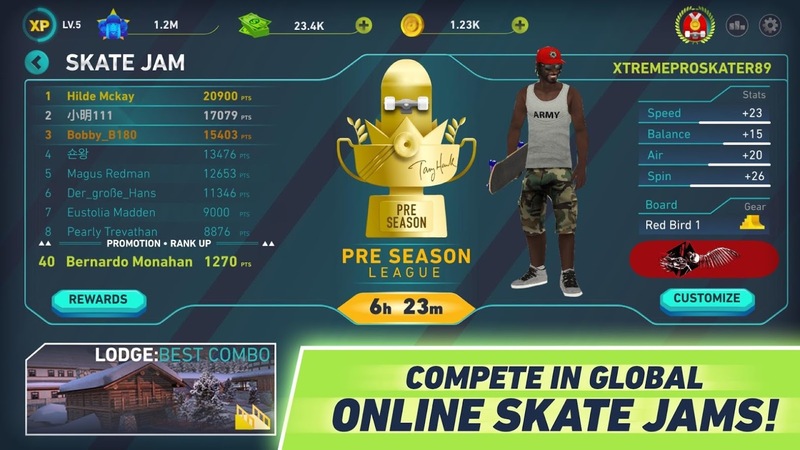 In the Skate Jam section, you'll have to try your hand at qualifying for the chance to compete against players from around the world by earning points and climbing the leaderboards. On the other end of the spectrum, the Career mode is a little more robust. It offers five different regions to work your way through by completing objectives that will earn you experience and fans. You can also enter into career tournaments to beat other pros and unlock new regions and gear. Of course, the main thing anyone unfamiliar with this release would like to know is whether or not it plays similarly to the original THPS games, and sadly I can't say it really fills that niche. Sure, Tony Hawk still has his name in the title, but that's where the majority of similarities between the two properties end. Tony Hawk's Skate Jam is pretty much a reskin of earlier mobile skateboarding titles from Ratrod Studio. So if you've played any of the Skate Party games published by Maple Media, you'll know exactly what to expect from this release. Now, this isn't to say the game doesn't have potential, and it would seem the devs have been improving the iOS release over the last month, so hopefully that work ethic continues and some real advancements come to the game sometime soon. As is the touchscreen controls aren't all that great. It can be tough to pull off multiple maneuvers in succession, and while the on-screen buttons are always accessible, timing can be very tricky since your movement isn't all that precise. Luckily you have the ability to change the controls to your liking in the settings, and if that doesn't float your boat, the included physical controller support should easily cover your needs. All in all Tony Hawk's Skate Jam offers exactly what I would expect from a FTP mobile game with a notable celebrity name attached. The monetization isn't the best, the touchscreen controls don't lend themselves well to the nimble and precise maneuvers of a skateboarding game, and the entire design offers little different over the earlier skateboarding titles from the developer. Thankfully there's still some fun to be had, especially if you plan on playing with a controller, but let's just say this isn't the THPS revival people were hoping for. At best it's an average skateboarding game with some potential. So here's hoping the devs can throw a few more updates our way to bring it in line with what people expect from a Tony Hawk release.